Continuing with my apparent crazy-person reading stint (see The Swan Thieves), this is the first book I yanked out of my huge library pile. But hey, apparently crazy works for me, because I adored this novel. By the end of the second page, I was hooked and knew that I’d be going out and buying my own copy. It begins with Veronika consuming four packets of sleeping pills and musing on a magazine article she has read about Slovenia as she calmly waits to die. That particular scene is poignant, moving and chatty yet formal. 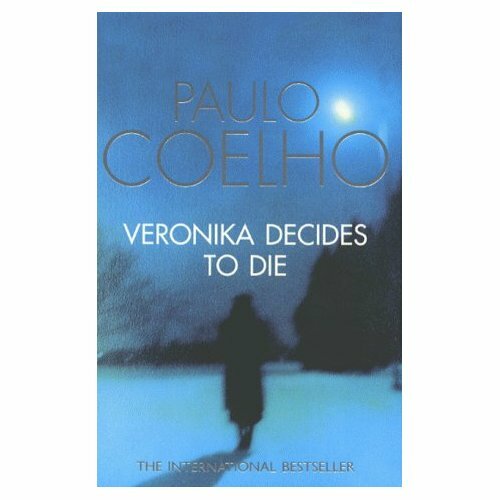 The title sums up her frame of mind clearly – Veronika has decided to die. She is not manic, crazy or passionate, but has come to the logical, quiet conclusion that she does not wish to live any longer. She regains consciousness in Villette, a mental hospital. Here she is told by Dr Igor that her drug-induced coma has damaged her heart and she only has days to live, a concept she feels no slight sense of victory in hearing. As Veronika goes through the motions of life in Villette, she slowly comes to realise that every second of existence is a choice we all make between living and dying. Unfortunately for someone in Veronika’s position, that realisation is somewhat redundant. As I worked my way slowly through the book, I had to keep stopping and staring into space to process what I’d read. It’s so moving but also accessible at the same time. As a manic depressive myself, I really appreciated how her feelings were accurately portrayed – Veronika doesn’t come across as weak or needy, just a person with an illness receiving treatment. Apparently there’s a film with Sarah Michelle Gellar as Veronika, so I might have to look that up in a few days. It must have been quite a difficult book to transfer to film, so I can’t wait to see how they’ve done it.